On Nov. 4th we picked up Angelina (she is Athena’s sister), 4 month old female. Back in August when we were contacted by the shelter to take Athena, we were told she had a sister. We said we would take her too. But then a shelter worker wanted her for herself. 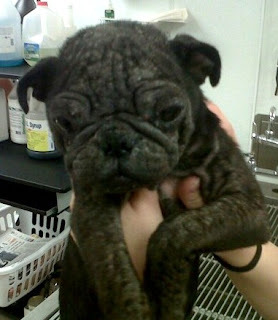 But on Nov. 3rd we got a call that Angelina’s mange was not getting better and they wanted to turn her in to us. We went to the 29 Palm Shelter to get her. Her mange is pretty bad, but she also has an eye ulcer and a heart murmur. We need to take her to a heart specialist to get an EKG and see what is going on and what we need to do to make her better. We are happy that she is now our care, but we need your help. Your tax deductible donation will go a long ways for Angelina to get the medical care she needs. As always thank you for your support! Angelina is doing well, though her progress is slow. We did take her to a cardiologist last week and had a total checkup and an EKG. The Eco didn’t show any heart abnormality, but there is a level 4 murmur which is a big concern. For now the Cardiologist wants to see her every 3 months and do an EKG and see how things progress. There is a possibility that she has Aortic Stenosis. In aortic stenosis, the aortic valve does not open fully. This restricts blood flow. This puts her at a higher risk when being put under anesthesia and other potential problems with the lack of proper blood flow. It takes about a year to truly diagnosed this properly. For now we will take care of her other issues and keep taking her to the heart specialist till she is 1 yr. old and then take it from there. Poor baby! at least she looks better than Athena did. My dog just jumps for the treat. she doesnt like it when i put even little pressure on her back as i move the treat over her nose. any suggestions? I would recommend you take it to the Vet. It could have a slipped disk or some back problems. The sooner you take him/her in, the less damage you will have. Would appreciate an update on Angelina and Athena. These posting are a year old.